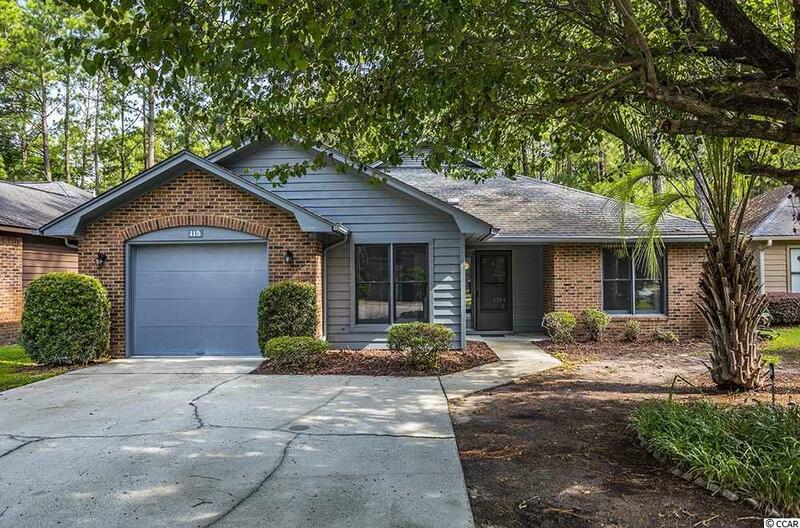 Here is a beautiful single level 3 Bedroom, 2 Bath 1 car garage w/Carolina room home tucked away under mature trees in the Myrtle Trace community of Conway. Just off the living area is the eat-in kitchen which is a cookâs delight with new Stainless-Steel appliances, plenty of cabinets & counter space, some new fixtures and pulls on the cabinets plus a unique back splash. The living room has a gorgeous, custom built-in cabinet that could be used as an entertainment center or as a curio cabinet to display all your collectables. In the Living room is wood laminate floors and a fireplace framed by 2 windows. There is a separate laundry room with a sink and lots of cabinets, plenty of room for a full-size washer and dryer. The Master Bedroom and Bath have a custom closet arrangement to keep your clothes organized! Ceiling fans and new carpets wrap up this cozy home. Low HOAâs is a plus, too! Great central location and close to all the Grand Strand has to offer: great championship golf courses, excellent restaurants, entertainment and shopping. Directions: Take 501 To Singleton Ridge Rd . Turn Left Onto Singleton Ridge Rd. Left Onto Myrtle Trace Dr. Turn Left Onto Boxwood Lane. #115 Is On The Right.